Aries April 2016 Horoscope predicts that personal accomplishments and your outer personality will be important as planetary power is located in the upper half of the horoscope. Things will change by 14th April and domestic issues will become important. You have to juggle both career and home affairs for a fine equilibrium. Spiritual issues will attract your attention and you will be interested in understanding inner self. Arians will take on major maintenance and beautification jobs on the home front. (Feng Shui tips for a beautiful home). Eastern half of the Ram’s birth chart is strong in April 2016 and hence free-will and autonomy will rule. Decide on your objectives in life and follow it up with hard work. If others are not helping, you can bulldoze others to follow you. No compromises are required on your goals or methods. The middle of the month will define the way you look and your personal image. The Aries 2016 April monthly predictions warn that planetary help is not forthcoming for your career. Hence progress will happen at a slower pace. Things will start progressing after the first week and there will be clarity in business issues. The office environment will be full of fun and frolic and many opportunities for partying with clients will crop up. There may be a job change due to the influence of eclipse. Businessmen may face labor problems. Employees will see major alterations in the organization and in their working environment. The financial intelligence of the Aries zodiac sign will be excellent during the month. Expect unexpected cash flows during the middle of the month. You will not hesitate to spend money for humanitarian causes and your financial activities will have a spiritual touch. You look for guidance from your intuition. After the 20th, Arians will earn money through speculative ventures or through quick rich schemes. Family will be wary of these methods and will keep a safe distance from your financial dreams. Love for single Rams will happen unexpectedly in April 2016. Love mates might be found in religious places. You are looking for partners with innovative capabilities and with superior qualities. Aries sexuality will play an important role when it comes to happiness of pregnant couples and marriage. 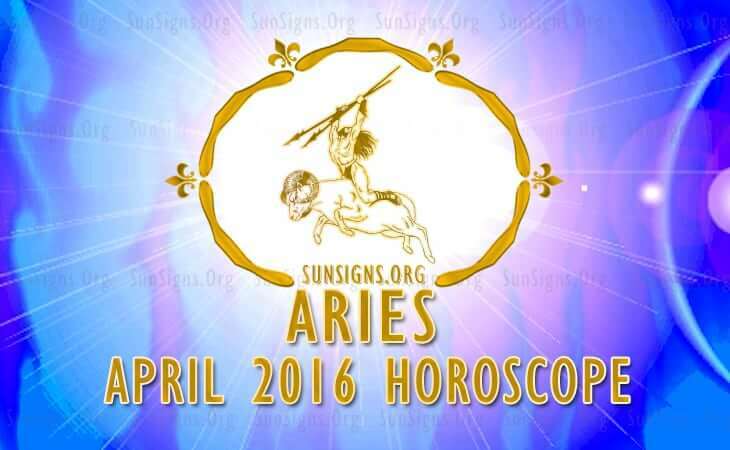 The Aries astrology forecasts for April 2016 predict wonderful health and well being. It can be further improved by regular yoga and walking. To conclude, April 2016 Aries horoscope warns that you will have to find the balance between work and home this month.